Whatever qualities he might previously have attributed to his coach, one leading squash player must have sensed that he shared at least some characteristics with another famous Yorkshire-born sports coach. 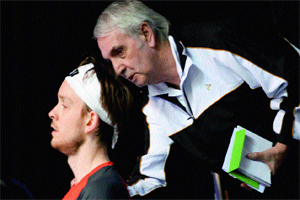 “Dad’s the Brian Clough of squash,” said World Number 1, James Willstrop just before the London Olympics. Whether this disclosure came as a surprise to Malcolm Willstrop is unknown. When Clough was in his heyday as a manager in the 1970s, Willstrop junior had not even been born. But Willstrop senior would certainly have been aware of Clough’s achievements, not just as a manager but as a player whose career was tragically cut short by injury. He would also have been aware of his outspokenness, arrogance and lack of respect for authority. And, although it was rarely mentioned in the mainstream media of the time, he may even have been aware of Clough’s attachment to something which embodied another of his sporting passions. 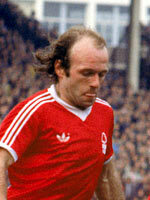 The sixth of nine children, Clough was born in 1935 in Middlesbrough in the North Riding of Yorkshire. Following national service in the Royal Air Force from 1953 to 1955, he joined his home town club, Middlesbrough, scoring 204 goals in 222 league matches including 40 or more goals in four consecutive seasons. However, he was also prone to submitting transfer requests on a regular basis and had a tense relationship with some of his fellow players. He was especially irked by Boro’s leaky defence, which conceded goals as regularly as he scored them. After a 6–6 draw against Charlton Athletic, Clough sarcastically asked his team mates how many goals he would have to score in order for them to win a match. While playing for Boro, Clough was capped twice for the England national team,failing to score on either occasion. Eventually, in July 1961, one of his transfer requests was finally accepted and he moved to Boro’s local rivals Sunderland where he scored 63 goals in 74 matches. 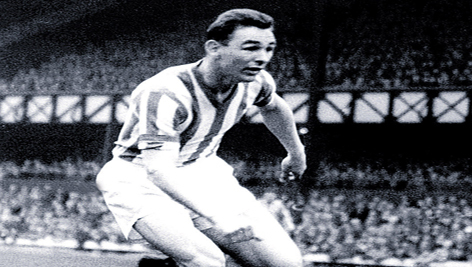 Clough’s goal-scoring powers were showing no signs of declining. But on Boxing Day 1962, disaster struck. Clough tore the medial and cruciate ligaments in his knee in a match against Bury, an injury which, in that era, usually ended a player’s career. Despite an attempted comeback two years later, Clough was forced to retire at the age of 29. Even today, for players scoring over 200 goals in the English leagues, Clough holds the record for the highest number of goals scored per game (0.916). But, with his playing career ended, Clough was not prepared to turn his back on football, or controversy. The story of Clough’s career in football management is an epic story punctuated not only with successful domestic and European campaigns, but also with controversies, clashes and fallings out on a heroic scale. That career started in 1965 with Hartlepool United and finally ended in 1993 with the relegation of his club, Nottingham Forest, from the English Premier League. Clough had won consecutive European Cups with Forest and League Championships with both Forest and Derby County. But it was in the 1970s that Clough’s managerial career was in the ascendancy, first with Derby County and then, after a tempestuous 44-day reign at Leeds United, with Nottingham Forest. It was during his time with Forest that Clough’s squash racket began to appear in an increasing variety of contexts. 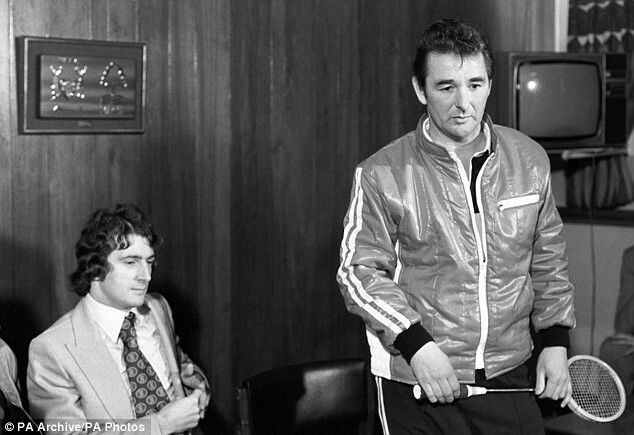 Following his forced retirement as a player, Clough had kept himself fit, taking part in five-a-side games during training sessions and, until the early 1980s, playing squash. During his 18 year stint at Nottingham Forest, he played on the courts at Trent Bridge Cricket Ground, a short walk from Forest’s stadium at the City Ground. His squash partners included Forest players, notably striker Garry Birtles, and members of the local press who routinely covered Forest’s home and away matches. But his attachment to his squash racket was not limited to his use of it on the squash court. 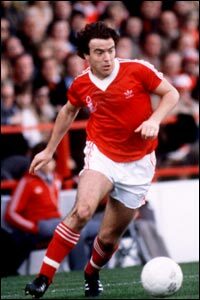 Joining Nottingham Forest from Birmingham City, striker Trevor Francis found himself waiting in Clough’s office well after the appointed time for his unveiling to the press. “It turned out that he had another engagement,” said Francis later. “He was playing squash over the road at Trent Bridge.” When Clough finally arrived, he was wearing a tracksuit and carrying his squash racket. Over the years, the racket clearly acquired a life of its own. Former Nottingham Evening Post Sports Editor Trevor Frecknall travelled throughout Europe with Forest reporting on their European Cup ties. He recalls that Clough always took his squash racket abroad on the off-chance that he could get a game should there be a court in the vicinity. The racket would also make regular appearances in the club’s hotel, at training sessions and even in the dug-out during matches. “On the third or maybe fourth occasion the fluency of the kick-about was interrupted by the ball disappearing into a mass of hardy shrubs, Clough raised his squash racket as the signal for the on-field trainer to blow his whistle and halt play. Each time the ball had left the pitch, it was because Archie Gemmill’s passes were just too far in front of John Robertson on the left wing. “Yes boss,” responded the little Scotland midfield player. “I bought you to give the ball to Mr Robertson,” drawled Clough. “So your job is to pass the ball to Mr Robertson’s feet,” Clough continued. Brian Clough died in 2004, two years before the appearance of ‘The Damned Utd’, a novel by British writer David Peace. The book, a largely fictional account of Clough’s 44 days as manager of Leeds United, re-ignited public interest in Clough’s career and his life. It was commercially successful but widely criticised by Clough’s family and former colleagues as being both inaccurate and unrepresentative of the man himself. 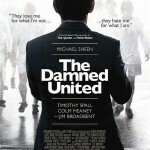 Three years later a film adaptation of the novel, ‘The Damned United’ appeared, directed by Tom Hooper and starring Michael Sheen as Clough. The film was generally well-received by critics but was again met with a chorus of disapproval from Clough’s family. Yet the place of Clough in the pantheon of flawed British sports heroes remains secure, the realities of his life and times interwoven with stories of what he may, or may not, have done or represented. So whatever James Willstrop’s may believe about his dad’s qualities, he can rest assured that one thing about Clough and his life is undisputed. The man loved his squash racket. 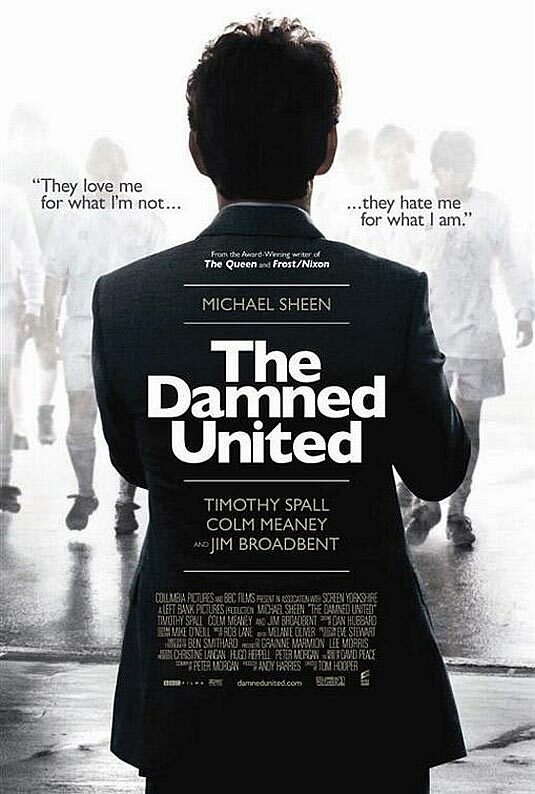 Thanks to Wikipedia for background information on Brian Clough, David Peace’s novel ‘The Damned Utd’ and Tom Hooper’s film ‘The Damned United.’ Also thanks to The Guardian for its article on James Willstrop, and The Daily Telegraph for its article on Peter Shilton. Thanks too, to The Daily Mail for its articles on Trevor Francis and Sean Dyke. You can read Trevor Frecknall’s recollections of Brian Clough in The Nottingham Post here, and find out more about playing squash at Trent Bridge Cricket Club here.